Have you ever wondered why some e-learning projects capture the imagination of the audience whilst others launch with a whimper and then wither and die over time? The management didn't really commit to the programme. There wasn't a structure in place to produce content, or to allow us to work with external content writers. There was a general failure to accept that an incremental approach to the programme would be best. That includes viewing modules as elements that need maintenance in their own right. There was no agreed process in place to review the development to allow for continuous improvement. We tried to put together a system that was really just trying to replicate a classroom. There was no planning to build modular and reusable content and templates. Not getting everyone involved and enthused with the goals of the programme. There wasn't a clear understanding of when and how our users access the web. You know your company is great and unique and of course you have a desire to forge your own path. (We talked a bit about how brilliant your company is here) So why would a programme that you want to implement do anything other than succeed? It's a mystery! One thing you might consider is looking at some of the best practice that is available and comparing your thoughts and assumptions. There is help and guidance available, and none of that stops you being unique or great. I was trying to explain this to my 12-year-old recently and the best analogy I could muster was to think of a car. Cars travel on roads, but they can vary enormously. Small ones might offer fantastic fuel economy whilst large ones might offer incredible speeds and comfort. 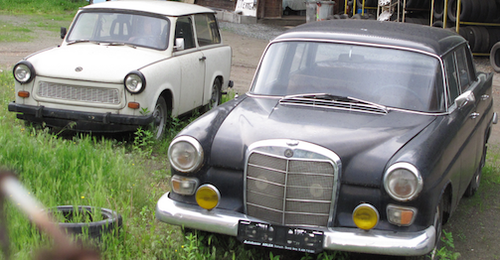 Eastern European cars of the 1960's and 70's were all pretty similar as the state wanted conformity and needed to offer extremely cheap motoring, but whilst they were used by lots of people, they were still terrible. People aren't all the same, however much a system might try to make them so. A car that suits a family with 3 children and a pet dog is going to be different to one that suits a single man in his early 20s. But neither choice is 'right' or 'wrong', hopefully it will just be 'suitable'. And so it is with an online learning programme. The courses need to operate on the road - in this instance, the worldwide web - after that it’s about selecting the size, colour, speed, extras that will make the programme suitable for your learners. So why think about training at all? People worry about the work environment. The economic climate of the past few years has served to remind us all that however much we love our work and workplace, none of us is immune to the shocks that can rock our world. Investing in yourself is therefore important. As a leader in your company, investing in your people is important as it makes your people feel valued. In order to get your programme up and running, identify key personnel to work with to get the programme in place and work towards that bottom line goal with employees who are more productive. But do remember that however good the programme looks, the reality of life is that some people will be engaged, some won't. That's life! The leader’s job is to describe the strategy to those key staff to bring them along. Learning is a social process, so if you can create a 'culture of understanding' (you can read more about that topic here) then you are well on the way to achieving a success story. If you'd like to hear more about how the team at Coracle approach open and social learning and why we believe that the best way to avoid the lurking traps listed above is to work closely with companies, professional bodies, institutes and charities, please get in touch.